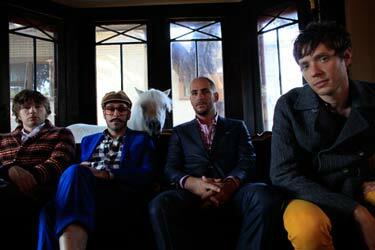 Ok Go To Perform At Northern Lights in Clifton Park, NY! Clifton Park, New York -OK Go headlined Tulip Fest in Albany this past spring and performed - in pouring rain and hail! - to more than 30,000 people. They're returning to the area, playing Northern Lights in Clifton Park on October 27. We were first introduced to the band (or at least most of us were) the summer of 2006. These crazy guys did a homemade music video...on treadmills? Whatever the case, 'Here it Goes Again' became a YouTube and internet phenomenon, viewed by more than a million people in the first six days. As of April 2010, the video had been viewed over 50 million times. It is the 7th most favorited video and the top favorited music video of all time on YouTube. It continued to go on to win a Grammy for 'Best Short Form Music Video.' This band sure knows how to work the online media platforms. The four have become famous for their low budget, quirky music videos that quickly go viral. A more recent one is their second video for the single 'This Too Shall Pass' which is a giant Rube Goldberg machine being filmed. But even more than having cool music videos, this band can play, too! Amazing energy, great vocals, bright clothing...the whole package. But don't take my word for it! Take a listen sometime, come see them perform at Northern Lights on the 27th of this month! Their most recent album is on their newly formed independent label Paracadute Recordings, 'Of the Blue Color of the Sky' which was released on January 12, 2010. Look forward to seeing you all at Northern Lights soon!